A stellar front row, indoor snow, the most prestigious venue in London town and a collection we want right now - what was not to love at Burberry's autumn/winter 2011 collection at London Fashion Week? A stellar front row, indoor snow, the most prestigious venue in London town and a collection we all want right now – what was not to love at Burberry’s autumn/winter 2011 collection at London Fashion Week? It was the London Fashion Week spectacle that set the style world alight and was streamed live to 30-foot wide screens in Picadilly Circus – as well as on marieclaire.co.uk. The Burberry Prorsum show attracted a full house with Rachel Bilson, Kate Bosworth, Mario Testino, Alex Chung, Lily Donaldson and Anna Wintour squeezing onto the front row – all wearing Burberry, of course. New face of the label, Jourdan Dunn opened the show in a striking tangerine sculpted coat and a dalmation fur hat before changing to a second outfit – a yellow and teal checked short trench and the skinny black flares that soon became the eponymous bottom half for Burberry A/W’11. Burberry’s creative director Christopher Bailey called this season his ‘Shrimpton Collection’ after the model and actress Jean Shrimpton and you can see the swinging 60s influence with nipped-in waists, glamorous fur accents and skin-tight flares. Aside from the odd piece in clay and a magnificent moss-coloured tweed fitted suit, Bailey’s latest collection was dominated by primary colours and graphic checks in tweed, wool and chunky knits – giving the sense of a very British heritage with a modern spin. To a soundtrack of Adele’s new track, Someone Like You, models sashayed down the runway with a louche elegance, culminating in a finale of bright lights, raptuous applause and simulated snow – all within the confines of the Kensington Gardens marquee. 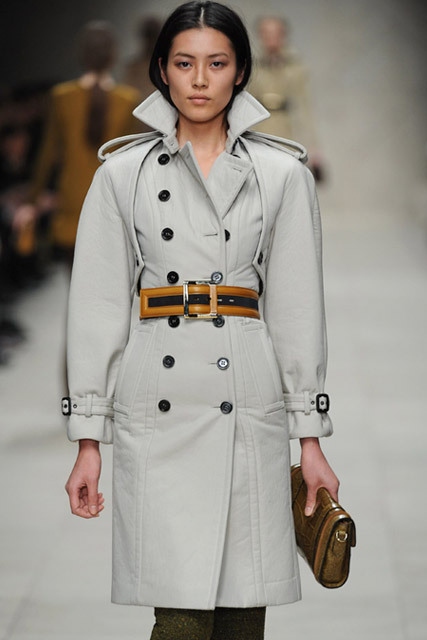 A Burberry show is never just a catwalk presentation, it’s an experience. And Bailey’s collection for A/W’11 was no exception.